Kate Connor has been a demon hunter for a great deal of her life. Her and her first husband were both demon hunters until they decided to start a family, when they both retired. Some years later Kate’s husband was mysteriously murdered and she suspected that maybe he had come out of retirement without her knowledge. 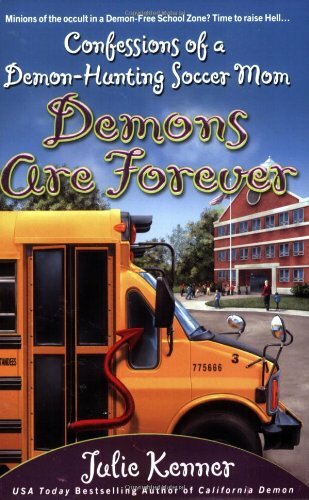 Since then she has remarried and had another child, but lately she has been unable to remain retired as demons start infiltrating her safe suburban town. Kate chooses to tell her daughter, Allie, the truth about what she does and of course Allie wants to become a demon hunter too. While this causes some stress for Kate her main concern is finding out why there are so many demons around and how she can protect her family from them. She believes the key to everything might be in her late husband’s possessions that she put into storage, but as she begins to uncover clues she also puts herself and her family into more and more danger. This humorous tale about a soccer mom who also fights demons on the side has fantasy, mystery, and witty elements that many readers will enjoy. The story seemed fairly simple at first, but ended up being more complex which makes it a fun ride to the end. On top of everything else, Kate seems real and flawed in many ways making the story that much more believable. She is not a superhuman perfect wife and mother who can do it all, which most people can relate to. Instead, she has to make priorities and hope she is doing the best for her family. Strongly recommended for those who are fantasy fans.